A fresh take on classic floral design, the Onkaparinga Chelsea Quilt Cover Set will brighten up any bedroom. 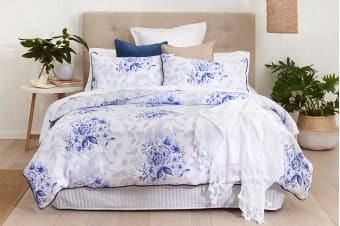 The Onkaparinga Chelsea Quilt Cover Set features a beautiful floral print in fresh blue and white with a coordinating print on reverse. Stylish in design, the 300TC quilt cover set remains smooth against the skin that offers superb sleeping comfort!